Vowel sounds can be tricky for young readers. How is it that the same letter can make two different sounds? Help your students practice the long and short /a/ sounds with this simple sort. Using pictures and words, students of all ability levels can be successful. This sorting activity can be used to review the long a and short a sounds. This is a word document, so you can easily edit the words in the document based on the words you are working on in classroom. Students sort the long and short a words and record their answers on the response sheet. Includes 20 long a words, 20 short a words, 2 blank crayons for you to write your own words, recording sheet, and an answer key. This worksheet has students sort long A and short A words. The long A words are sorted by spelling pattern. 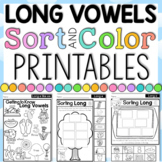 Students can practice sorting their long and short a sounds through this fun writing sort. Students have 20 words that they cut out, sort, then glue on a sorting sheet. Answers are included. This is 2 pages of sorting heavy and light, plus long and short! Sorting activity for long and short vowels. Cut and paste long and short a sort. 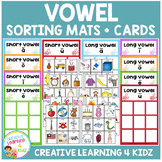 Colorful activity - vowel sort for short and long a pictures. This product includes a cut and paste worksheet, great for assessment or small group instruction. Students will be able to read, cut, sort and paste short and long a words.